Marc Bohner holds a MSc and PhD degree in Materials Science from the Swiss Federal Institute of Technology of Lausanne (1990 and 1993). His career included positions as postdoctoral fellow at the University of Utah (1994 – 1995), and the Swiss Federal Institute of Technology of Zurich (ETH Zurich; 1995 – 1998). Currently he leads the “Bioceramic & Biocompatibility Group” of the RMS Foundation in Bettlach, Switzerland. He is also member of the management board. His career focus has been biomaterials, in particular bone graft substitutes / calcium phosphates. His interests comprise the synthesis, nanostructuration, and use of various calcium phosphates, the improvement of present delivery techniques for bone substitutes (in particular calcium phosphate and polymer cements), and the application of these materials, methods, and concepts in clinical applications. He holds over fifteen distinct patents, is the inventor of 4 commercial products, and has published and presented widely in his field (120 articles; h = 45-53). He has given 130 invited lectures in English, French, and German. His teaching positions have included adjunct and affiliated appointments at the University of Sherbrooke (2004 – 2016), the University of Berne, and ETH Zurich. 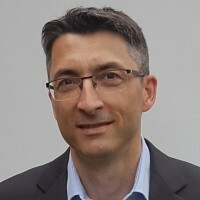 His professional service has included: Editor of Acta Biomaterialia (2008 – present); Co-chair of the annual congress of the European Society for Biomaterials (2009); Secretary, vice-president and president of the Swiss Society for Biomaterials, (2004 – 2012); Secretary and president of “GRIBOI” (2007 – 2016); Secretary and then treasurer of the European Society for Biomaterials (2013 – present); Member of the Research Council of the Swiss National Science Foundation (2016 – present); Editorial board member of “J Biomed Mater Res B” (2006 – present), and “Biomaterials” (2008-2011). In 2013, he received a “honorary life membership” from the Swiss Society for Biomaterials. In 2014, he was awarded the “Racquel LeGeros Award” of the “International Society for Ceramics in Medicine” for his contribution to calcium phosphate research. In 2016, he became “honorary president” of GRIBOI.